Lippincott Publishing, c1973, Stated First Edition, 1st EDITION , 160 pages. GOOD+ to VERY GOOD Condition Hardcover with a GOOD+ to VERY GOOD Condition Dust Jacket protected with a Mylar Cover. This book is ex-library with usual markings, fep removed, some wear to book corners and cover & light dj edgewear and sunned dj spine. Pages & Binding are NICE & TIGHT! The ruffed grouse is known by over a hundred colloquial and local names, including mountain bird, fool hen, and partridge. Found in wooded areas throughout the United States and Canada, it is also acknowledged as the King Of The Game Birds by many experienced hunters. 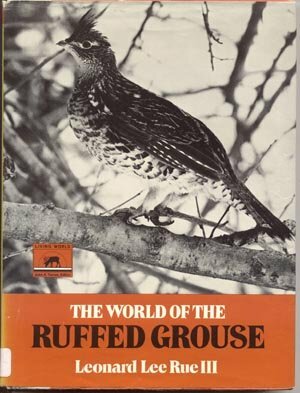 This book is filled with facts about the grouse's life through all 4 seasons, illustrated with photographs. It is an excellent resource. Buyer pays $4.55 Shipping in Continental U.S. **Payment must be received within 10 days of the end of the auction, unless other arrangements are made. Checks held till clear. Money Orders & Paypal Payments shipped on receipt. Buyer Must Request Insurance at Additional Expense for $1.40 for up to $50. IL residents Must add 7.25% sales tax. Please E-mail me any questions you may have before bidding. Thanks! Happy Bidding! Good Luck!